Miasmatic interpretation is an essential factor in clinical practice to achieve the results remarkably. Dr.K.Savitha illustrates a few psoric cases that treated at AKP Homoeopathic Clinical Research Center. 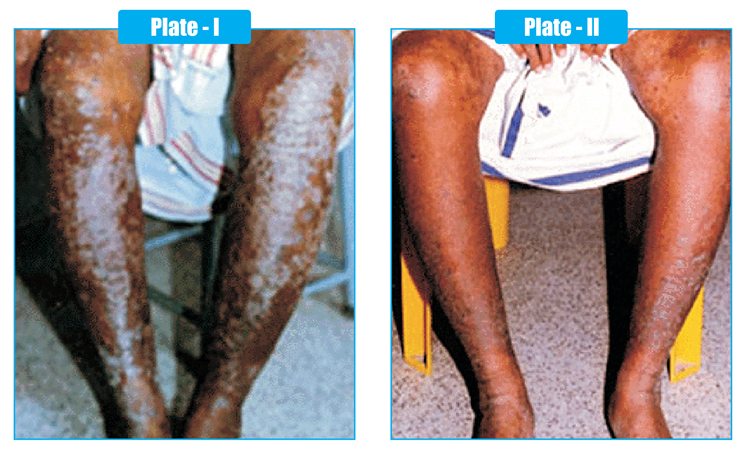 A male aged 78 years was suffering from severe itching and oozing of skin in both the legs since fifteen years. He tried all topical medications, oral medications from all systems of medicine but ended in vain. Finally he opted for Homoeopathic treatment. Initially he had rashes in the both legs, gradually matted together to form small vesicles. They matted together and started oozing. Itching was a terrible symptom, he scratched until it bleeds. The characteristic of the discharge while consulting was watery and slimy; has no odour. It gave a dry and leathery appearance. However there was a general aggravation of all symptoms during winter interpreted. He was not a Diabetic or Hypertensive and blood parameters were within limits. Has the habit of drinking tea and coffee. Mental and intellectual state of mind is irritable, anxious, very sensitive and emotional, very moody and changes frequently, depressed easily. The case study states that he was prescribed with petroleum 200 tds for one day, followed with 15 days placebo. Petroleum was prescribed indicating the leathery dry appearance with itching and winter aggravation. The immediate follow up stated that severe oozing and itching of the lesions with moderate pyrexia. Simply placebo followed and petroleum was prescribed on monthly interval in the further follow ups. There was aggravation of complaints for the first two months and finally the intensity was reduced in later months. The patient was all right with his complaints and the skin looked normal pattern without further recurrence and withdrawal of the case. 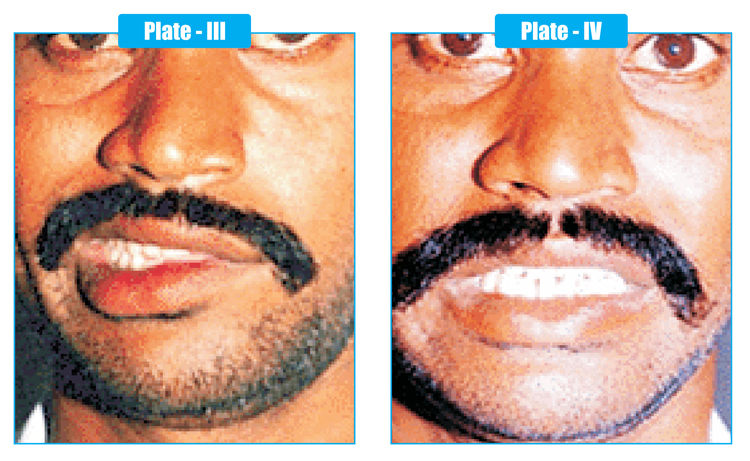 (Refer Plate - I & II) His case was completed with a final prescription of Sulphur 1m tds/one day. This case is a typical example for psora. The symptoms of desquamation look apparently syphilitic, but they are pseudo psora as explained by Hahnemann. Here the Petroleum was the first prescription considering the pseudo syphilitic tendency. The past history suggests the itching and oozing lesions with clear discharge which tract the case study to Graphites, but the presentation of symptoms with dry leathery pattern of the skin gives information on suppression and also pseudo syphilitic state. The anti psoric drug petroleum was prescribed by its active state behind and also considering the modality winter aggravation. It brings the morbid state and finally recovery of the patient with conclusion of anti psoric drug sulphur which could prevent the further recurrence. A male aged 38 years consulted for sudden facial weakness and loss of function. He slept in the open air, lying on the terrace ground last night. When he woke up he found the right cheek with numbness and weakness. While drinking coffee it was drooling on the right cheek. He was unable to close his right eye. When he tried to blow the air it leaked out. He presented the typical symptoms of Bell's palsy with causative factor of cold exposure. His past History revealed recurrent cold attacks, treated with modern medicines. Has the habit of drinking of coffee and cigarette smoking. Mental and intellectual state of mind is calm, gentle and mingles easily with friends. First prescription was Causticum 1m tds for one day followed with placebo. His complaints vanished off within fifteen days. Even though the symptom similarity track this case to the prescription with miasmatic consideration of psora, sudden sensitization of the vitality; drags the condition to a syphilitic state and express it as loss of function and its associated symptoms. The active miasmtic state and the expression of the symptom lead to prescription of causticum, which recovered the patient totally.